Learn about the different parts of Medicare which cover different services. Part A (Hospital Insurance) Most people do not have to pay for Part A. Part C (Medicare Advantage Plans) Medicare Advantage plans are offered by private insurance companies as an alternative to Original Medicare; plans are government subsidized and regulated. Medicare card to find out if you have Part B. If you have Part B, you pay a Part B premium each month. Most people will pay the standard premium amount. Social Security will contact some people who have to pay more depending on their income (http://www.socialsecurity.gov/pubs/10536.html). If you don’t sign up for Part B when you are first eligible, you may have to pay a late enrollment penalty. Some people automatically get Part B. 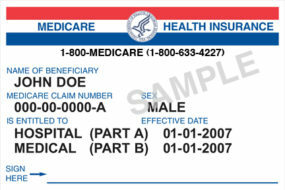 Learn how and when you can sign up for this coverage .(http://www.medicare.gov/Publications/Pubs/pdf/11219.pdf). Medically-necessary services – Services or supplies that are needed to diagnose or treat your medical condition and that meet accepted standards of medical practice. Preventive services – Health care to prevent illness (like the flu) or detect it at an early stage, when treatment is most likely to work best. HMO Point of Service (HMOPOS) Plans – An HMO plan that may allow you to get some services out-of-network for a higher cost. Medical Savings Account (MSA) Plans – A plan that combines a high deductible health plan with a bank account. Medicare deposits money into the account (usually less than the deductible). You can use the money to pay for your health care services during the year. Not all Medicare Advantage Plans work the same way, so before you join, take the time to find and compare Medicare Health Plans in your area. Once you understand the plan’s rules and costs, you may be able to join by completing a paper application, calling the plan, or enrolling on the plans website. Medicare also has information on quality to help you compare plans. To get the prescription drug coverage, you must join a plan run by an insurance company or other private company approved by Medicare. Each plan can vary in cost and drugs covered. Medicare Advantage Plans (like an HMO or PPO) or other Medicare health plans that offer Medicare prescription drug coverage. You get all of your Part A and Part B coverage, and prescription drug coverage (Part D), through these plans. Medicare Advantage Plans with prescription drug coverage are sometimes called “MA-PDs.” You must have Part A and Part B to join a Medicare Advantage Plan. When you join a Medicare drug plan, you’ll give your Medicare number and the date your Part A and/or Part B coverage started. This information is on your Medicare card. Medicare Plans. Visit the Medicare Prescription Drug Plan Finder for a list of Medicare drug plans in your area. Medicare benefits, coverage options, rights and protections, and answers to the most frequently asked questions.